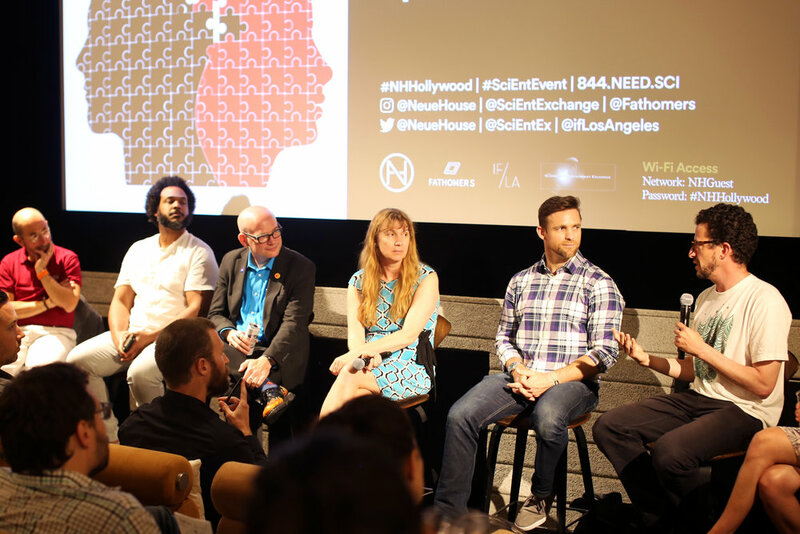 On June 28, at NeueHouse Hollywood, Fathomers co-presented Science Speed Dating—7 top scientists giving 7-minute talks on their latest developments and game-changing work—with the Science and Entertainment Exchange (a National Academy of Arts and Sciences program) and the Museum of Imagined Futures. Fathomers enlisted as presenters two visionary thinkers who commingle fields of science and art: Tahir Hemphill, data sculptor and rap researcher; and Phil Ross, aforementioned inventor and founder of MycoWorks. Tahir’s “Hip-Hop Word Count” database collects information from the lyrics of hundreds of thousands of rap songs since 1979, permitting language analysis related to, for example, syntax, sentiment, and rhyme. As a hip-hop corpus, it forms the basic text for the Rap Research Lab, an educational curriculum and youth program founded by Tahir—and for his own artistic practice, as well. In his latest project, Maximum Distance. Minimum Displacement, Tahir isolates geographic data specific to 12 artists, converts that data into a system of geo-coordinates, and then uses those coordinates to direct the movements of an industrial robot arm, ultimately producing abstract sculptural forms. Commissioned by California College of the Arts, in San Francisco, the show runs September 5 through October 14 at CCA’s Hubbell Street Galleries.